I scrap out of chronological order. I tend to do the 'easy' layouts first, the ones with 1-3 great photos that tell a clear and finite story, like a first day of school layout. There aren't tons of photos, the topic is obvious, and the story tells itself. Easy. I procrastinate scrapping events, trips, or celebrations with tons of photos. It's hard narrowing down the photo choices and to squeeze onto a single page. It can also be hard deciding which story (or stories) I want to tell. Such was the case with the layout from our first Family Olympics in 2013. In addition to there being lots of photos with many different potential stories, I'd left the group photo out of the layout about my niece Allison's baptism, which was the primary reason my relatives were visiting. I was so annoyed with myself. I wanted to scrap the photo, but I didn't want a second page about the baptism. 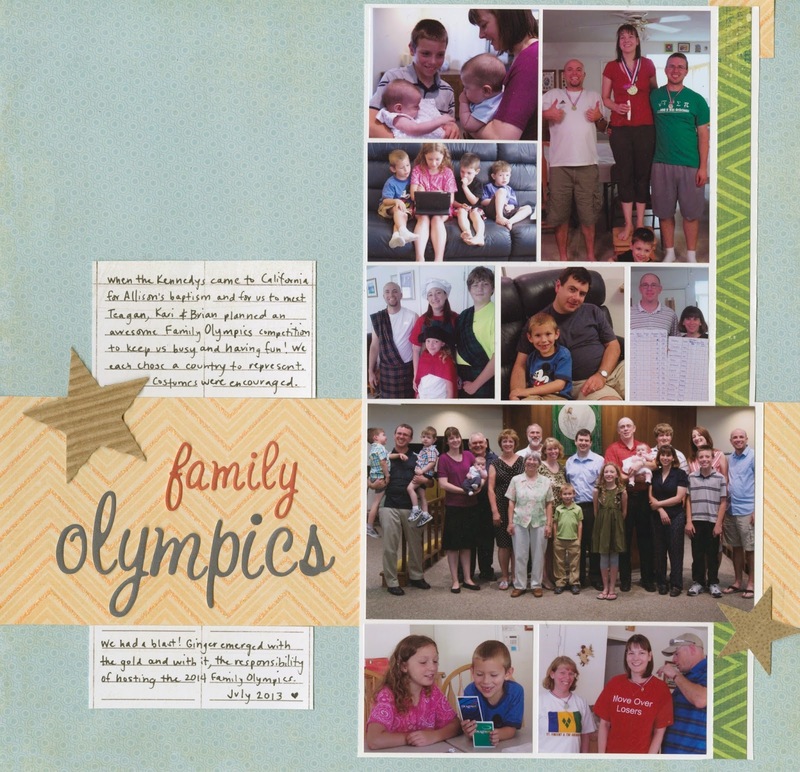 I ended using it as the focal image on this layout, titled Family Olympics. The journaling tells the story about our first-ever Family Olympics, but I used the group photo from the baptism, the photos of baby cousins Allison and Teagan meeting for the first time, and the older cousins playing together too. They don't support the story directly, but instead are part of the fun times we had together over that long weekend. I'm happy to get this one into the album. Loveeeeeeeeee this! LOVING how many photos you got on here and the stars too!!!!! This turned out great! :) There have been a couple of times when I've reused a photo on two layouts, because of an event, as well as a story about the photo, or something along those lines. I just make sure not to have the layouts back to back in the album!